Saint Leo University uses a game-based storyline to invigorate professional learning. In Saint Leo University's Alternate Reality Learning Experience, participants weave in and out of a fictional story and reality as they learn. During a recent online professional development session, Jeff Borden was talking to some three dozen instructors about the history of U.S. public education when there was a loud banging on his door. "Oh, dear — I've got to go. I'll be back as soon as I can," he told participants. And with that, he fled — leaving behind his assistant, Greg Kunzweller, to explain that Borden had uncovered a possible "shadow government" conspiracy dating back to the 1930s, designed to hold back education reform. Borden was now on the run from these nefarious agents, Kunzweller said, and he invited session participants to help him piece together clues that would help them solve the mystery behind the conspiracy. Suddenly, the educators taking part in this unusual professional learning activity organized by Saint Leo University found themselves part of an elaborate Alternate Reality Learning Experience (ARLE) designed by Borden, the university's chief innovation officer, and his colleagues. An ARLE is a new type of alternate reality game in which participants weave in and out of a fictional story and reality as they learn. "We had three goals" for the event, Borden said. "First, we wanted participants to acquire new knowledge about the U.S. education system and education reform. Second, we wanted them to be immersed in the process of learning, and to have fun. Third, we wanted to show them how they could create the same types of learning strategies in their own classrooms." Borden has prior experience designing ARLEs for students. Before joining Saint Leo University, he worked for Pearson Education, where he designed learning games such as Contagion, in which students worked in teams to stop a deadly virus from spreading worldwide. At Saint Leo, he also designed an alternate reality game for students around the 2016 presidential election, in which students played various roles in a mock presidential debate hosted by the university. But this was his first use of an ARLE for professional development. "In gaming, you fail 80 percent of the time, and you enjoy the experience and come back for more," he said. "This lets you put students in situations where they fail, and learn from their failure, safely. At the same time, the authenticity of the learning experience is off the charts." To deliver the ARLE to educators, Borden and his colleagues teamed up with Edchat Interactive, a company that is working to transform online professional development into a more interactive experience that reflects how people learn best, and Games4Ed, a nonprofit organization that brings together educators, researchers, game developers, and publishers to advance the use of games and other immersive learning strategies in education. "We wanted to show that live online PD can be fun, engaging, and instructional at the same time," said Mitch Weisburgh, co-founder of Edchat Interactive. His company co-hosted the event with Saint Leo, using a video platform called Shindig to bring together educators from around the country for the experience. Shindig supports peer-to-peer video chat and sharing, which enables live online events to become more interactive. "When people try to share information via a webinar, that's not the way most of us learn," Weisburgh said. "People don't learn by watching somebody discuss a series of slides; they learn best by interacting with others and reflecting. Great teachers always have people break into groups to accomplish a task, and then the different groups all report back to the group as a whole. That should be replicable online." Shindig allows for this kind of experience. In a Shindig event, participants use webcams to see each other in a shared online space. A featured presenter can give a talk, teach a class, give a live performance or share a multimedia presentation; meanwhile, audience members can move freely in and out of private video conversations with whomever they choose, simply by clicking on that person's avatar. The presenter also can bring up chosen participants to share the "stage" and interact with the host and presenter in front of the entire group. With Shindig, you don't just listen to a presentation, Weisburgh said — you also get "reflection and social learning." Borden and his team at Saint Leo used the platform to lead educators on an ARLE that explored the origins of the U.S. public school system, the alternative visions for education put forth by reformers such as Dewey, Piaget and Vygotsky, and contemporary reactions to those ideas. After Borden's abrupt departure, participants had to solve a riddle to gain access to a virtual Padlet board, where they found documents suggesting a government-led conspiracy against these reformers. Over the next few nights, they had to solve clues found on hidden Web sites and social media outlets to bring the "conspiracy" to light. While the conspiracy itself was made up, participants learned about the ideas of Dewey, Piaget and Vygotsky and how these were controversial during their time. They also got to experience game-based learning firsthand. In a follow-up session a few days later, Borden explained how he and his colleagues had created the event and gave advice on how to build an ARLE of one's own. Identify the learning outcomes you are looking for, and then construct a storyline that will allow participants to achieve these outcomes, Borden recommended. He added: "A good narrative is at the heart of an effective game." 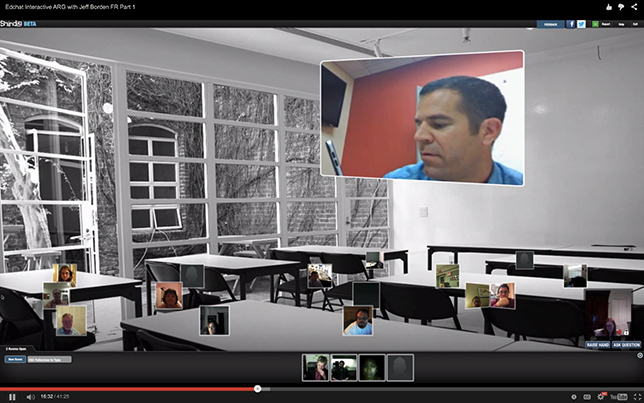 Using simulations for professional development is fairly common. For instance, in SimSchool, a program developed by educational scientists at the University of North Texas and the University of Vermont, new and pre-service teachers can try out their craft in a simulated classroom environment, doing the same activities as actual teachers but getting real-time feedback from the simulated program and their instructors. Christopher Like, a science teacher and STEAM coordinator for the Bettendorf Community School District in Iowa, developed a game-based model for ed tech professional development that has been adapted by K-12 school districts across the nation. His game, Mission Possible, has teachers complete 15-minute "missions" in which they learn technology skills and advance to successively higher levels. "It engages teachers' competitive nature just like Call of Duty does with my eldest son," he wrote in a blog post. But the use of ARLEs for professional learning seems to be less common. Edchat Interactive is hoping to partner with national education conferences to create more online ARLEs for educators. "Piaget said the mind is wired to learn through play," Weisburgh said — and that applies to adults as well as to younger students. The use of alternate reality gaming for professional development "was a great idea," said Steve Isaacs, who teaches video game design and development at William Annin Middle School in Basking Ridge, N.J. Isaacs, who took part in the Saint Leo event, said he liked the idea of a "conspiracy theory" around Vygotsky's "lost work." "It was fun to go out on the Internet and use the clues provided to try to solve the [mystery]," he said. "It really sparked imagination and created a great experience for those who were in the game."